Before I can build Firefox i needed to install some build tools. To guide me through the process i used Mozilla’s Documentation. 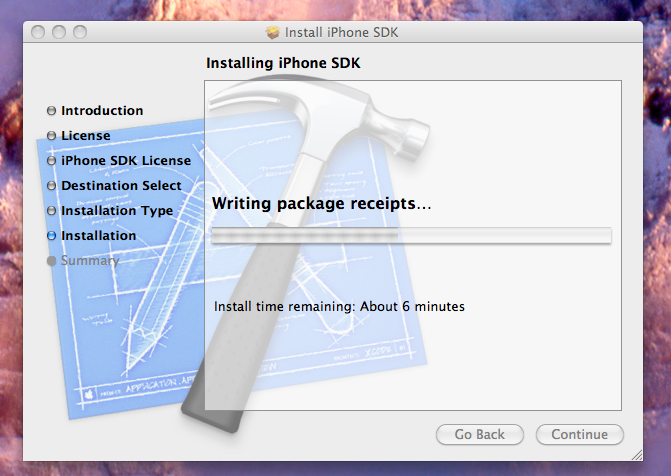 To get started you need Xcode and MacPorts, if you need help installing these visit my post on Installing Git on Mac OS. Due to the fact that the audio data api is brand new it is always changing and therefore the version numbers and patch links I am providing may be outdated visit the audio api wiki to check for updates. Type the following commands in the terminal. Make sure all ‘ and ” are correct. For more information and if you are not running Mac OS 10.6 visit Build Prerequisites. You are now ready to run the browser. If you have other versions of Firefox installed you will need to make a new profile. If you have been following along with my Apple OS/Cocoa blog you know that I am taking an Apple programming course. If this is the first you’ve heard about it read more here. Last week I borrowed an iTouch from my school to help me with developing apps. (The school got a wicked discount of $8…Be carefull Apple, with those deals you might go bankrupt). Anyhow, I decided to make some use out of my new device and download an IRC app that would help me with my processing.js project. Seems simple enough right? Well lets see. What a wonderful error message, don’t you agree? Well I thought i had a browser issue so I made multiple attempts: Minefield, Firefox, Chrome, IE. But nope the same issue. You want to know what the problem was? It simply didn’t like my gmail account so i had to use a different email address. Alright fine, now can I download my app? I went back to the store, clicked install, put in my account information, pressed ok….. You want to know what happened? The device returned to the Home screen and a pop-up displayed the error ‘Authorization failed. Please connect to iTunes.’ OMG do not tell me I need another account!!!!! I pressed the iTunes thumbnail on the device to see if I can find a ‘log in’ button. i scrolled down and behold a label that said ‘Account: myemail’. So Now i was really confused am I logged in or aren’t I? 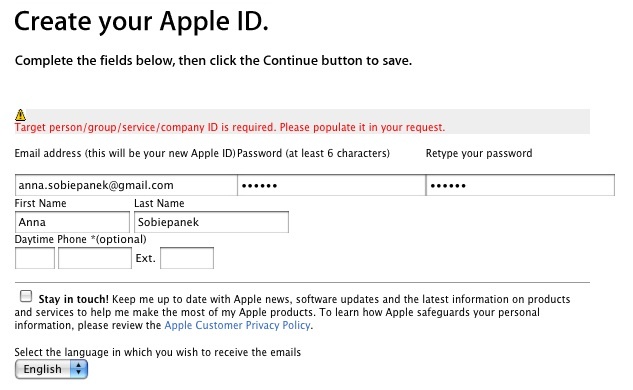 I tried doing the above steps a couple times which was really annoying because the form that is used to log into your apple account before you can download the app clears so you have to reenter your email and password again and again. Normally this wouldn’t be a problem but i can’t see why i would want to go to the extremes to secure an apple store account. Another wonderful error message. I decided to put the iTouch away because if i broke it I would have to dish out $200. I came back the next day and after attempting to log into the apple store via iTunes, and finally I was taken to the ‘Fill in ur Credit Card Info’ screen. So this is Apples idea of a secure site. Right. There is no way I am putting in my Credit Card. Now comes the next question…. How does one share an app? As you can tell, i am still trying to figure out how to dismiss the keyboard. You would think its automatic since there is a ‘Done’ button but it’s NOT. You can download my source if you wish to try it. I recently decided to take the Apple programming course available at my school (Seneca College). 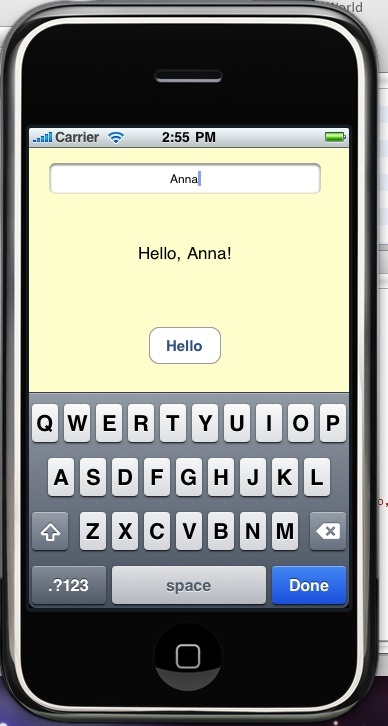 The main idea here is to develop a fully functional IPhone or ITouch App. This is going to be quite challenging as I do not own a MAC (thanks to Amazon.com and their lack of ethics) but I think it will be FUN. Luckily, my school has enough MAC machines so I just have to buckle down and stay at school and dish out the extra money for parking. 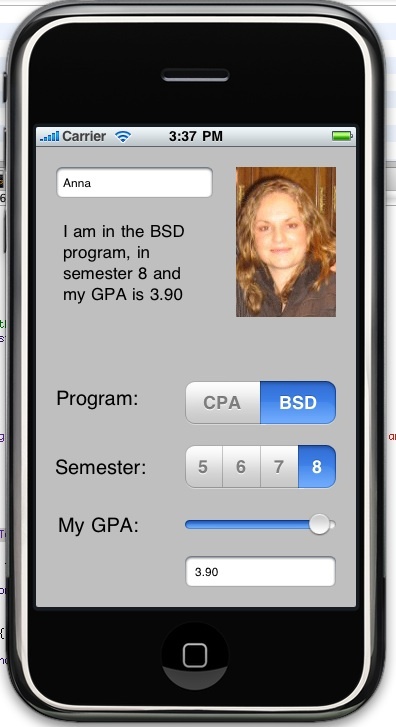 I will try to post frequently and post screen shots of my app. Well, before anything I need an idea… Feel free to suggest stuff via post comment, all comments are appreciated. Stay tunned….